In August 2016, we launched Lisn. We started as a hackathon project, and in a couple of months, we’d built something that we loved using. Here was an app that let you listen to music with a friend in a chat room, almost like you were in the same room. We used it everyday and loved the experience. Our launch revealed that people loved it too. 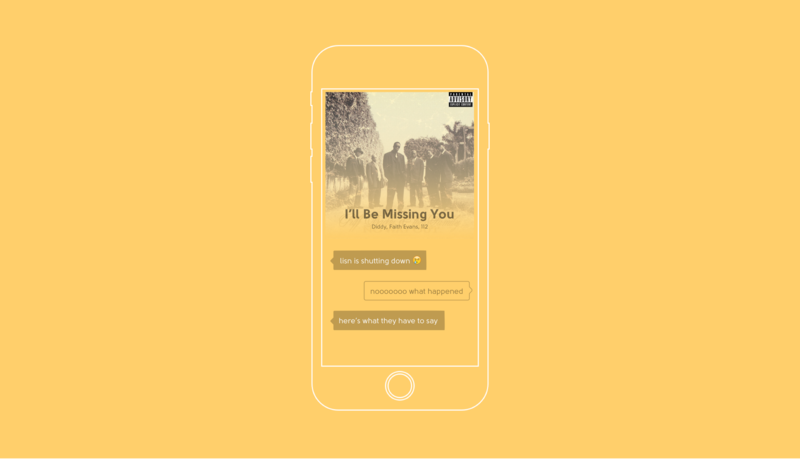 In the first month, we were covered by international publications (including TechCrunch and Wired), hit #2 trending on ProductHunt, and saw over 2k people share over 20k songs and many moments together on the app. And these numbers kept growing. The app spread via word of mouth in college campuses and offices. 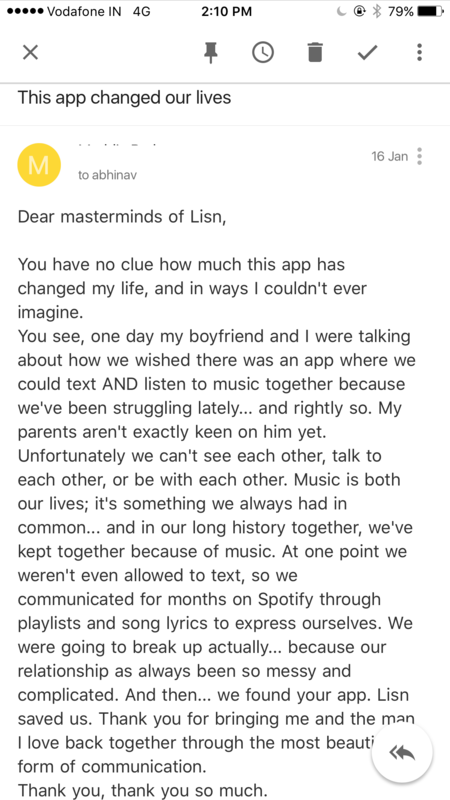 Friends used it to recommend music to each other, long distance couples used it to stay connected, and musicians used it to collaborate. From launch to today, over 120,000 songs have been streamed by over 8,000 people. We’ve received highly encouraging messages, stories of how people are using Lisn, and countless bug reports and feature requests. We spent a couple months figuring out what to do next and deconstructing what went wrong. Doing a post mortem on a product you’ve worked on for more than a year is hard, but it helps get closure and make you really think about what you’ve learned. I like to think about it in terms of things within our control and things that we had limited or no control over. The former is something that can be solved as you grow as a person and get better at your craft. The latter is something you learn to live with, not to be stressed by, and eventually solve when the time is right. We thought of product market fit (PMF) and retention very closely. If people are coming back to the app a lot, there’s a PMF. If not, then we haven’t cracked PMF yet. Over time, we realized that the two were related but separate issues. The fact that we were steadily receiving ~100 downloads per week for months, and feature requests every week was a sign of good product market fit. The five of us on the team had amazing, horizontal experiences building products for Indian and global consumers. In our individual freelance experiences, we had worked with founders in Silicon Valley, startup hubs in Europe and in India on building MVPs. We also held full-time roles in companies like Housing.com, PayTM and Airtel Wynk which are companies known for their well designed, successful products. On paper, we had amazing product building experience. What we lacked however, was taking products and scaling them. We could always work on new features and respond to feature requests, but our approach was always from the lens of product design rather than the systematic lens of analytics driven product improvement. We were always super close, and sometimes made the right moves too, but we never had the solid direction to understand how to approach retention and keep iterating to fix it. We learned a lot by doing, but we didn’t have these skills from the start. And by the end of it, we were burned out. The number #1 thing everyone tells you when building a music product, is not to build a music startup. How there have been no successful music products. Even Spotify and SoundCloud, two of the biggest players aren’t making money and are constantly in turmoil. Now you can listen to this advice, read the articles and thinkpieces and stop what you’re doing, OR do it anyway and figure it out for yourself. We were compared to Turntable.fm and others, but the problems they faced were very different from the problems we faced. And that’s only natural, the music industry has changed a lot in the past 5–10 years. With cheaper data and cheaper phones, more and more of the world’s music is now being streamed. For the first time ever, more music is now bought digitally than physically. Problems music startups faced five years ago are obviously not the same problems music startups will face now. A lot of doors have been unlocked, but there are now newer doors with tighter locks. The next step is differentiation. Building on top of universal libraries to offer new experiences (Discover Weekly, Beats Radio, synced music chat (?) etc). But these are features, rather than products. The best people to make an attempt at solving these problems, are the teams at these companies. We’ve had the opportunity to directly talk to artists, execs at music labels, music promotion agencies, streaming services and even telecom companies that want to make a play in music. We definitely have a much better idea of the music industry after working on Lisn. We received a couple acquisition offers from different players too, but nothing seemed like the best way forward for Lisn. What we’ve found is that the best way to solve these problems is from the inside, rather than from the outside. Lisn solved a problem but it wasn’t one that was big enough. Vibhas spent a couple months in San Francisco with General Assembly, and met multiple entrepreneurs there to learn from them. With Lisn, he started as an interaction designer but is now an iOS developer too. He is currently at Entrepreneur First in Singapore, working on his new startup, Cryptosquad. Abheyraj spent some time freelancing as an iOS developer, building apps. With Lisn, he began to explore product design and made a lot of contributions, including our app icon! He now works as a designer in Berlin for GoEuro. Bhargav started in Lisn as a full-stack developer with ML/AI research experience. He learnt what it takes to build consumer apps and how to think in terms of value provided to people rather than tech solutions. He is currently a part of Entrepreneur First and is working on his new startup, MediosTech. Tejas joined us towards the last few months of our journey to build our Android app and we got to a really good point. Unfortunately it was too late for Lisn and the app never made it beyond a small beta. He is currently working on interesting fintech and fraud detection problems with one of the world’s biggest online poker companies, PokerStars. I learned how to get people excited about what you’re building and how to seed your first few thousand users. I’m currently leading the design team at Unacademy and writing a book on freelancing called Pajama Profit. The point of a startup, or of building a team is to make something bigger than you could individually. Working together, your impact isn’t just the sum of your skills, it’s way more than that (1+1!=2). At Lisn, we not only learned how to be better at our core skills, but also learned a whole lot from each other. The point is to build a collective that together can have a huge impact. The moment that ceases to be true, and 1+1<2, it’s a better idea to go back to working solo or with a collective that could use your impact. Each of us learned a great deal at Lisn, but at the moment, our skills are better suited to make an impact elsewhere. But if ever in the future, any of us needs to build a product and the moment is right, we know who to turn to. Lisn’s servers will be shut down on August 31st, 2017. Startup dies after nearly topping Product Hunt charts. Founder shares hard lessons learned.